This article is about planet Earth and all life upon it, including human civilization. For other uses, see Earth or World (disambiguation). The Blue Marble, a photograph of the planet Earth made on December 7, 1972 by the crew of the Apollo 17 spacecraft. The history of the world is commonly understood as spanning the major geopolitical developments of about five millennia, from the first civilizations to the present. In terms such as world religion, world language, world government, and world war, the term world suggests an international or intercontinental scope without necessarily implying participation of every part of the world. The world population is the sum of all human populations at any time; similarly, the world economy is the sum of the economies of all societies or countries, especially in the context of globalization. Terms such as "world championship", "gross world product", and "world flags" imply the sum or combination of all sovereign states. The English word world comes from the Old English weorold (-uld), weorld, worold (-uld, -eld), a compound of wer "man" and eld "age," which thus means roughly "Age of Man." The Old English is a reflex of the Common Germanic *wira-alđiz, also reflected in Old Saxon werold, Old Dutch werilt, Old High German weralt, Old Frisian warld and Old Norse verǫld (whence the Icelandic veröld). "World" distinguishes the entire planet or population from any particular country or region: world affairs pertain not just to one place but to the whole world, and world history is a field of history that examines events from a global (rather than a national or a regional) perspective. 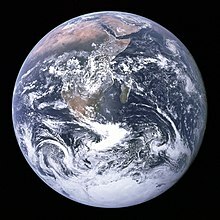 Earth, on the other hand, refers to the planet as a physical entity, and distinguishes it from other planets and physical objects. "World" was also classically used to mean the material universe, or the cosmos: "The worlde is an apte frame of heauen and earthe, and all other naturall thinges contained in them." The earth was often described as "the center of the world". The term can also be used attributively, to mean "global", or "relating to the whole world", forming usages such as world community or world canonical texts. By extension, a world may refer to any planet or heavenly body, especially when it is thought of as inhabited, especially in the context of science fiction or futurology. World, in its original sense, when qualified, can also refer to a particular domain of human experience. The world of work describes paid work and the pursuit of a career, in all its social aspects, to distinguish it from home life and academic study. historically, the New World vs. the Old World, referring to the parts of the world colonized in the wake of the age of discovery. Now mostly used in zoology and botany, as in New World monkey. The Garden of Earthly Delights triptych by Hieronymus Bosch (c. 1503) shows the "garden" of mundane pleasures flanked by Paradise and Hell. The exterior panel shows the world before the appearance of humanity, depicted as a disc enclosed in a sphere. In philosophy, the term world has several possible meanings. In some contexts, it refers to everything that makes up reality or the physical universe. In others, it can mean have a specific ontological sense (see world disclosure). While clarifying the concept of world has arguably always been among the basic tasks of Western philosophy, this theme appears to have been raised explicitly only at the start of the twentieth century and has been the subject of continuous debate. The question of what the world is has by no means been settled. The traditional interpretation of Parmenides' work is that he argued that the everyday perception of reality of the physical world (as described in doxa) is mistaken, and that the reality of the world is 'One Being' (as described in aletheia): an unchanging, ungenerated, indestructible whole. 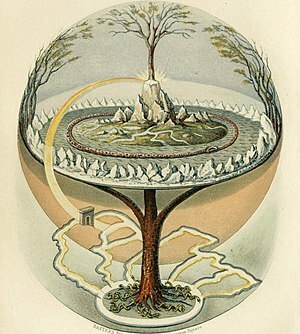 In his Allegory of the Cave, Plato distinguishes between forms and ideas and imagines two distinct worlds: the sensible world and the intelligible world. In Georg Wilhelm Friedrich Hegel's philosophy of history, the expression Weltgeschichte ist Weltgericht (World History is a tribunal that judges the World) is used to assert the view that History is what judges men, their actions and their opinions. Science is born from the desire to transform the World in relation to Man; its final end is technical application. The World as Will and Representation is the central work of Arthur Schopenhauer. Schopenhauer saw the human will as our one window to the world behind the representation; the Kantian thing-in-itself. He believed, therefore, that we could gain knowledge about the thing-in-itself, something Kant said was impossible, since the rest of the relationship between representation and thing-in-itself could be understood by analogy to the relationship between human will and human body. Two definitions that were both put forward in the 1920s, however, suggest the range of available opinion. "The world is everything that is the case," wrote Ludwig Wittgenstein in his influential Tractatus Logico-Philosophicus, first published in 1921. This definition would serve as the basis of logical positivism, with its assumption that there is exactly one world, consisting of the totality of facts, regardless of the interpretations that individual people may make of them. In response, Sigmund Freud proposed that we do not move about in a common world, but a common thought process. He believed that all the actions of a person are motivated by one thing: lust. This led to numerous theories about reactionary consciousness. Some philosophers, often inspired by David Lewis, argue that metaphysical concepts such as possibility, probability, and necessity are best analyzed by comparing the world to a range of possible worlds; a view commonly known as modal realism. Mythological cosmologies often depict the world as centered on an axis mundi and delimited by a boundary such as a world ocean, a world serpent or similar. In some religions, worldliness (also called carnality) is that which relates to this world as opposed to other worlds or realms. In Buddhism, the world means society, as distinct from the monastery. It refers to the material world, and to worldly gain such as wealth, reputation, jobs, and war. The spiritual world would be the path to enlightenment, and changes would be sought in what we could call the psychological realm. In Christianity, the term often connotes the concept of the fallen and corrupt world order of human society, in contrast to the World to Come. The world is frequently cited alongside the flesh and the Devil as a source of temptation that Christians should flee. Monks speak of striving to be "in this world, but not of this world"—as Jesus said—and the term "worldhood" has been distinguished from "monkhood", the former being the status of merchants, princes, and others who deal with "worldly" things. "Therefore I command you to do as I believe you are willing to do, that you free yourself from worldly affairs (Old English: woruldðinga) as often as you can, so that wherever you can establish that wisdom that God gave you, you establish it. Consider what punishments befell us in this world when we neither loved wisdom at all ourselves, nor transmitted it to other men; we had the name alone that we were Christians, and very few had the practices." Although Hebrew and Greek words meaning "world" are used in Scripture with the normal variety of senses, many examples of its use in this particular sense can be found in the teachings of Jesus according to the Gospel of John, e.g. 7:7, 8:23, 12:25, 14:17, 15:18-19, 17:6-25, 18:36. For contrast, a relatively newer concept is Catholic imagination. Contemptus mundi is the name given to the recognition that the world, in all its vanity, is nothing more than a futile attempt to hide from God by stifling our desire for the good and the holy. This view has been criticized as a "pastoral of fear" by modern historian Jean Delumeau. During the Second Vatican Council, there was a novel attempt to develop a positive theological view of the World, which is illustrated by the pastoral optimism of the constitutions Gaudium et spes, Lumen gentium, Unitatis redintegratio and Dignitatis humanae. In Eastern Christian monasticism or asceticism, the world of mankind is driven by passions. Therefore, the passions of the World are simply called "the world". Each of these passions are a link to the world of mankind or order of human society. Each of these passions must be overcome in order for a person to receive salvation (theosis). The process of theosis is a personal relationship with God. This understanding is taught within the works of ascetics like Evagrius Ponticus, and the most seminal ascetic works read most widely by Eastern Christians, the Philokalia and the Ladder of Divine Ascent (the works of Evagrius and John Climacus are also contained within the Philokalia). At the highest level of world transcendence is hesychasm which culminates into the Vision of God. Orbis Catholicus is a Latin phrase meaning Catholic world, per the expression Urbi et Orbi, and refers to that area of Christendom under papal supremacy. It is somewhat similar to the phrases secular world, Jewish world and Islamic world. ^ Orel, Vladimir (2003). A Handbook of Germanic Etymology Leiden: Brill. pg. 462. ISBN 90-04-12875-1. ^ Record, R (1556). Castle of Knowledge. cited in The Oxford English Dictionary. World, sense 8. (Subscription required (help)). ^ e.g. Sacrobosco (1230). Treatise on the Sphere. trans by Lynn Thorndike, 1949. Archived from the original on 2013-05-19. ^ Heidegger, Martin (1982). Basic Problems of Phenomenology. Bloomington: Indiana University Press. p. 165. ISBN 0-253-17686-7. .
^ Biletzki, Anat; Matar, Anat (3 March 2014). Zalta, Edward N., ed. "Ludwig Wittgenstein". Stanford Encyclopedia of Philosophy (Fall 2016 ed.). Retrieved 3 December 2017. ^ Heidegger (1982), p. 164. ^ Hemer, C. J. “Worldly.” Edited by Geoffrey W. Bromiley. The International Standard Bible Encyclopedia, Revised. Wm. B. Eerdmans, 1979–1988. ^ Attas, Islam and Secularism, p.
^ Kurien, Prema (2006). "Multiculturalism and American Religion: The Case of Hindu Indian Americans". Social Forces. Johns Hopkins University Press. 85 (2): 723–741. doi:10.1353/sof.2007.0015. "World". The World Factbook. Central Intelligence Agency. This page was last edited on 21 February 2019, at 18:40 (UTC).